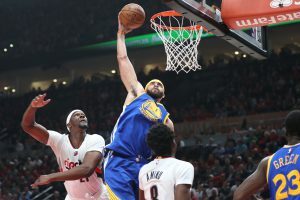 JaVale McGee came up huge against Portland — and man, does it feel weird to be saying that. I haven’t been blogging about the playoffs so far this year, for a couple of reasons. One of them is a desire — which I think I share with the whole of Dub Nation — to do everything differently from the way we did it last year. The loss in Game 7 of the Finals left a bad taste in our mouths that will not be cleansed until and unless our team hoists the trophy again. Which does tend to take a little bit of the fun out of things. Long gone are the carefree, overachieving Warriors of 2014–15. With the addition of Kevin Durant, this year’s team carries a heavy burden of high expectations, and anything short of a title will be considered an abject failure. A few days ago this song came up on the iPod I keep in the bathroom, and every time that happens I end up listening to it a bunch of times because it is such a goddamn beautiful tune. It’s from Stephen Malkmus’ first solo album, which is now…wow…16 years old. Hit it, Steve. Irma’s version is not the original — it was done first by trombonist Kai Winding and his orchestra in 1963. But it was her cover, recorded in early 1964, that provided the template for the version the Stones did later that year. This song is used to chilling effect in the movie Fallen, which I think is about due for another viewing at our home. It also was featured in an episode of Treme, which was set in New Orleans, which brings us full circle and lets me get on with my day. Now for something a little more contemporary…this week’s choice is a song from America’s most beloved rap duo, Killer Mike and El-P, also known as Run the Jewels. These two guys are each talented on their own, but the chemistry between them is something special. This was on display a few weeks ago when they came to town in support of their latest album. It was flat-out one of the loudest things I’ve ever experienced – ribcage-rattling loud – but survivable with the help of earplugs and vastly entertaining. If they ever come to your town, you should check them out.